"In this year one James Everell, a sober, discreet man, and two others, saw a great light in the night at Muddy River. When it stood still, it flamed up, and was about three yards square; when it ran, it was contracted into the figure of a swine: it ran as swift as an arrow towards Charlton [Charlestown], and so up and down [for] about two or three hours. They were come down in their lighter about a mile, and, when it was over, they found themselves carried quite back against the tide to the place they came from. Divers other credible persons saw the same light, after, about the same place." Being objective about the sighting, the Charles River, prior to being dammed, had great tidal flow, and would drain much of Back Bay each day, and then replenish it. Muddy River likely had a larger volume of water flowing through it in 1639, but it is unlikely that a great eddy existed near its mouth. Thus, it is unusual for witnesses to assert they were unmoved by tidal flow (in a small boat) for more than two hours. Witnesses also stated that the lights contracted into the shape of a swine. 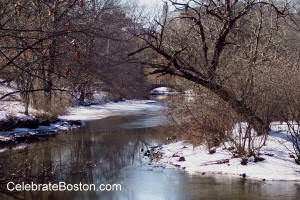 Muddy River, the hamlet, eventually became the separate town of Brookline. Pigs and other cattle were stored there during summer while corn was growing in Boston. It is safe to deduce that the UFO witnesses had seen or heard swine on the same day they observed the great light. Thus, the lights resembled a common animal, making it probable they saw ignis fatuus mirage phenomena in the darkness. In any case, the event was observed by divers (many) people, and noteworthy enough for the Puritan Governor to document it in his private journal. In 1644, the first USO sighting occurred over Boston Harbor, and then a major UFO sighting took place at New Haven, CT, in 1647.